An elegant Ivory Check Ribbon with a Matching Wired Edge. 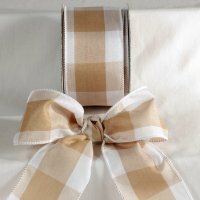 This Check Ribbon makes it ideal for your gift boxes, gift bags, craft projects and more! The Wired Edge of this Check Ribbon will bring extra body & hold making this Check Ribbon a decorator's delight! Width: 2 1/2" & 5"